A stroke patient struggles to open a door. An amputee is frustrated at the erratic movements of his new prosthetic limb. And a healthy young individual is disappointed with how her body looks in the mirror. These troubles can stem from disruptions to the brain’s maps of the body; a problem observed in a whole host of other conditions. We currently have a limited understanding of these maps and how they adapt to changes of the body. 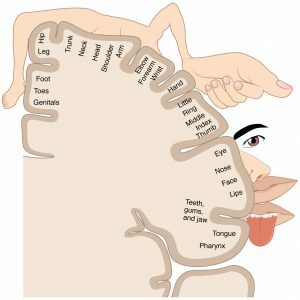 What are brain maps and why do we need them? You might wonder why we need such maps of the body anyway. If you open almost any textbook on perception it will list only five senses; vision, hearing, touch, taste, and smell. Are these senses alone sufficient to guide everyday tasks such as a simple reaching and grasping movement? The current consensus is that the answer is no. One way to think about this is that having no map would be analogous to navigating the roads using only a compass. Difficult? Having a brain map is equivalent to having a street directory with that compass so you can get to where you want to go. So to make accurate movements we integrate sensory input with maps of the body. These maps were first identified in the primary somatosensory cortex (SI) – the region of the brain that receives and interprets touch. Interestingly the map in SI is distorted compared to the body, much like how an atlas represents a distorted view of the world. We do not normally experience the body as distorted even though these brain maps are distorted. So there must be other processes that correct for the distortion. 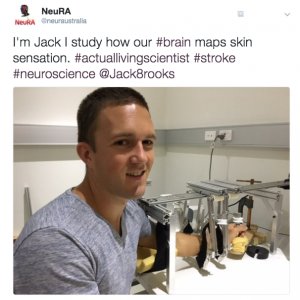 Researchers at NeuRA are trying to understand how to measure these brain maps so that we can compare them to those with impaired sensation. We have learnt about how this distortion is corrected by using illusions. An illusion is a discrepancy between the physical stimulus and perception. You may have played the schoolyard game where someone runs his or her finger slowly along your arm and you feel it at the elbow before it gets there. Similarly, pickpockets have exploited these limitations of touch processing for many years. Scientists are only beginning to discover the mechanisms behind these tricks and their potential as a tool to investigate brain maps. Even with the help of illusions studying brain maps is difficult for a variety of reasons. First, there is no dedicated receptor for brain maps unlike the traditional five senses. Second, the body is always there so the sense cannot be easily manipulated. Third, it is difficult to engineer a device to mechanically stimulate a non-uniform surface. Fortunately the workshop was able to help us get around this problem, with a device that uses brushes that contour to the arm. Using this device we set out to change the map by exploiting the assumptions that the brain makes when it is uncertain about touch. The brain assumes that two touches occurring nearby on the skin at about the same time arise from the same object. This assumption was first described for touch motion in the Cutaneous Rabbit Effect in the 1970’s (see gif, below). The brain also prefers to resolve sensory input of a moving object as having a smooth motion. In our experiment we used continuous motion of different speeds before and after the Cutaneous Rabbit Effect to perceptually distort the intervening patch of skin. The illusion in our experiment was robust if the perceptual response was measured not long after the physical stimulus was given. We are testing if the illusion persists for minutes to hours. For this intervention to work the illusory touch must convince the brain that a lifetime of experience about the shape of the body is wrong. Fortunately we know that such maps can change – as they adapt to changes in our body’s shape as we grow. If these maps didn’t update, this process would be like using an old street directory to navigate through a developing city. Some stroke patients experience a disorderly map of the hand. Researchers at NeuRA showed that distorted maps of the hand recover with time. This finding is promising given that others have also shown that the brains map remain amiable to change many years after stroke. However fast action is probably best. For instance, a prosthetic implanted not long after an amputation is often effective. If the illusion we used does work it will be able to speed up and optimise remapping after stroke and aid the incorporation of prosthetic limbs.